Moose in North America seem to conveniently pick and choose where they want to live. And at 1800 pounds each, not many mammals will argue. However, as wildlife conservation expert Phillip Elden explains in the following brief conversation, moose may have unavoidable reasons for their migration and decline. Q: Where are moose most common? 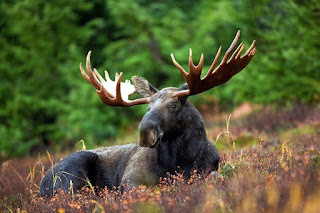 Phillip Elden: In North America, moose are found throughout Canada (with the exception of the Arctic and Vancouver Island), in the Rocky Mountains, New England, Michigan, Minnesota, North Dakota, and around Lake Superior. Q: Has the moose population been affected by human encroachment? Phillip Elden: Perhaps to some extent but, more than most animals, moose don’t seem to care where humans live as long as they have access to young forest growth. The biggest threat to these gigantic creatures is actually a minute parasite known as the brain worm. A brain worm infection may cause erratic behavior and death. Ticks are another chief threat to calves, as heavy a infestation can kill an immature moose. Q: Are moose considered to be predator or prey? Phillip Elden: Moose are herbivores meaning they do not dine on other animals. Because of their size, moose are only preyed upon by the fiercest pack animals in the wild: wolves. Scientists have discovered, however, that the majority of moose attacked and eaten have only been caught because of preexisting susceptibility brought on by illness or injury. Q: Why is the moose population declining? Phillip Elden: Moose are a migrating animal. They do not return to the same spot year after year unless conditions are ideal. Because of this, many areas, including the entire state of Minnesota, have experienced a decline. Alaska, which has been subject to warmer temperatures over the last century, has seen a 23% increase in its moose population since the late 1800s.